Just give it another six months and when you sit down and realize you haven’t messed with an injector since in anyway shape or form you might shed a tear. Is this an xjet or mjet? X jet and M5jet are both xjets. This is neither one. 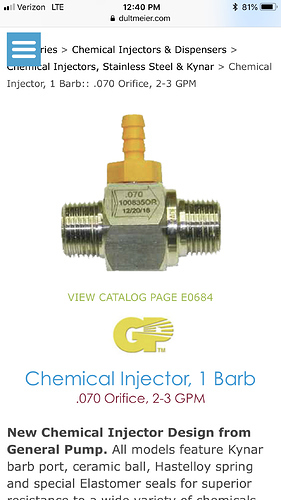 This is simply a DS injector with an orifice to meter chem induction. I would assume so. Just make sure to do a bucket test and test a couple proportioners. The gray proportioner may be perfect like it is for 7’s and 8 gpms, but 4 gpm’s pull a little stronger mix by nature if I remember correctly so a test is definitely suggested. Thanks! I’ll order it and let you guys know how it works. I’ve read before to step down one size of injector, but never really understood why. You’d think the manufacturer would know what size injector works best with a certain flow rate. I too bought one of these injectors but haven’t used it yet, as my GP high draw is still working fine. I’m using the GP high draw on a 4000/4gpm machine in the 3-5 gpm model with 150 ft of hose and I’m pulling about 9-1. I also have the GP hi draw injector and having the same results. I would sure love to skip the mixing part though! No mixing would be nice, but do you think you could get a richer draw rate with a smaller orifice injector? I don’t know, I’m just asking as I’ve never tried. 9-1 seems pretty stout to me as far as injectors go, and that’s what I’m getting with a 3-5 gpm injector. Will a 2-3 give me a richer mix? What exactly is the reason for stepping down an injector size? Is it supposed to increase your draw? Or is it for a different reason? I thought it was done to increase draw. Am I way off? Increase draw and reduce issues with hose length I believe. I see, that’s what I thought. I’m gonna have to buy a 2-3 gpm just to test this theory. I’d be surprised if a smaller orifice gives me a richer mix. Yes. If you’re already getting 9-1 I wouldn’t bother. I am not sure what the max is but that has to be close. I also run a 4gpm, I get 9:1 with the GP 3-5gpm just like you, and I get 7:1 with the 2-3. I run 250ft of hose no issues with either. I also have another injector that I get 16:1 with, I usually just run that with straight SH and its great. It must just restrict the water to get the 7-1 rather than pull more chemical. If that’s the case you’d be sacrificing gpm’s to gain a tighter ratio. Or maybe it has something to do with the pressures before and after the injector. It’s all a guess, and pretty irrelevant to me since I’m getting 9-1 with a 3-5 gpm injector, which works for everything I’m doing.